Forum Waterptc → Waterptc News and Information → Waterptc News and Announcements → Neteller and Skrill Added As New Payment Processors & Minimum Withdraw Limit Is Increased From $2 to $5. Neteller and Skrill Added As New Payment Processors & Minimum Withdraw Limit Is Increased From $2 to $5. 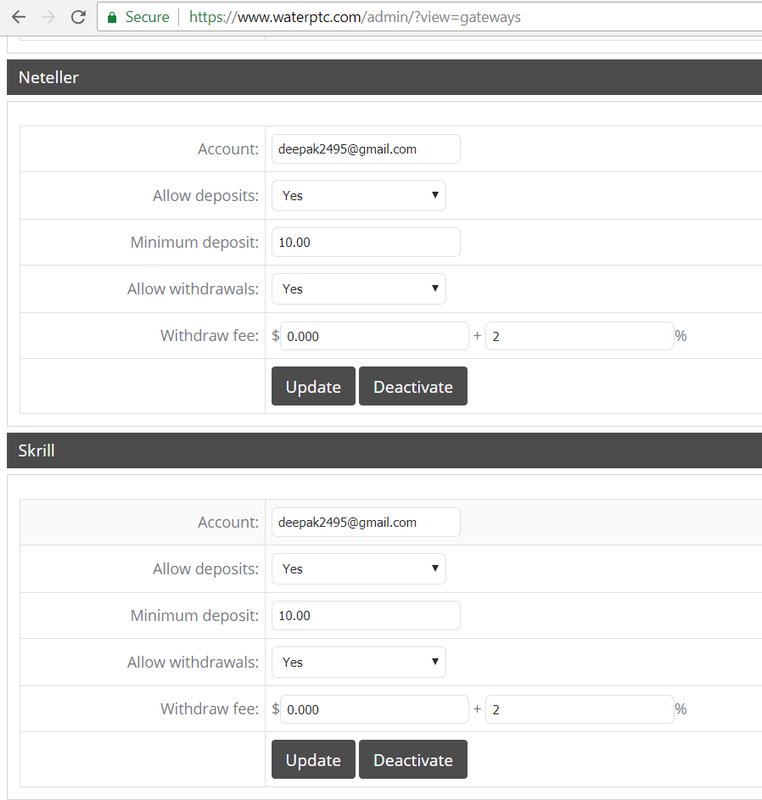 We enabled Neteller and Skrill for Deposits and Withdraws. 1). Any Member who deposited only via Perfect Money is allowed to withdraw via Perfect Money only. But if we found any member to request withdraw via Payeer, Neteller & Skrill after deposited through Perfect Money, then the pending payment of that member will be refunded and after two refunds that member will be suspended from Waterptc. 2). Any Member who deposited only via Payeer is allowed to withdraw via Payeer only. But if we found any member to request withdraw via Perfect Money, Neteller & Skrill after deposited through Payeer, then the pending payment of that member will be refunded and after two refunds that member will be suspended from Waterptc. 3). Any Member who deposited only via Neteller is allowed to withdraw via Neteller only. 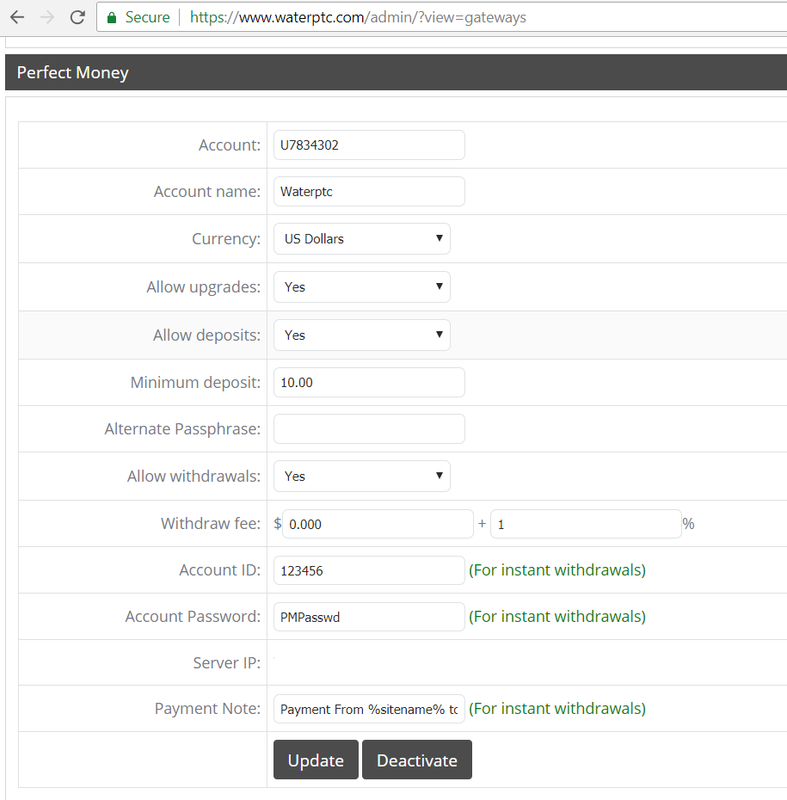 But if we found any member to request withdraw via Payeer, Perfect Money & Skrill after deposited through Neteller, then the pending payment of that member will be refunded and after two refunds that member will be suspended from Waterptc. 4). Any Member who deposited only via Skrill is allowed to withdraw via Skrill only. But if we found any member to request withdraw via Perfect Money, Neteller & Payeer after deposited through Skrill, then the pending payment of that member will be refunded and after two refunds that member will be suspended from Waterptc. 5). Any Member who deposited via both Perfect Money and Payeer is allowed to withdraw via both Perfect Money and Payeer but in limits. =>For Example 1:- If a Member named "S" who Deposited Total $1000 or more via Perfect Money and Total $999 or less via Payeer or Neteller or Skrill, then S is allowed to withdraw Total $999 or less via Payeer or Neteller or Skrill and unlimited amount via Perfect Money for the lifetime. =>For Example 2:- If a Member named "S" who Deposited Total $1000 or more via Payeer and Total $999 or less via Perfect Money or Neteller or Skrill, then S is allowed to withdraw Total $999 or less via Perfect Money or Neteller or Skrill and unlimited amount via Payeer for the lifetime. =>For Example 3:- If a Member named "S" who Deposited Total $1000 or more via Neteller and Total $999 or less via Payeer or PerfectMoney or Skrill, then S is allowed to withdraw Total $999 or less via Payeer or PerfectMoney or Skrill and unlimited amount via Neteller for the lifetime. =>For Example 4:- If a Member named "S" who Deposited Total $1000 or more via Skrill and Total $999 or less via Perfect Money or Neteller or Payeer, then S is allowed to withdraw Total $999 or less via Perfect Money or Neteller or Payeer and unlimited amount via Skrill for the lifetime. =>For Example 5:- If a Member named "S" who deposited Total $1000 via Perfect Money, Total $1000 via Payeer, Total $1000 via Neteller & Total $1000 via Skrill, then S can withdraw unlimited amount via Perfect Money or Payeer or Neteller or Skrill or by all 4 Payment Processors(means can change payment processors anytime and unlimited times to withdraw) for the lifetime. 6). Any Member who deposited via Payza is allowed to withdraw via Perfect Money or Payeer or Neteller or Skrill or by all 4 Payment Processors(means can change payment processors anytime and unlimited times to withdraw) for the lifetime. But, if any member wants to deposit more funds via Perfect Money or Payeer or Neteller or Skrill or by all 4 Payment Processors, then that member has to follow limits for withdrawals. 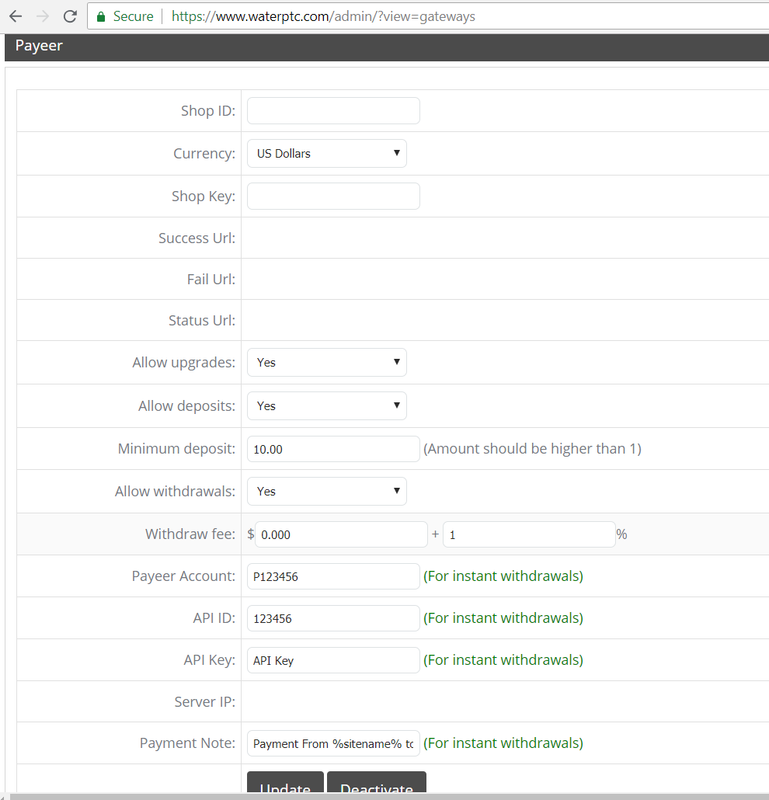 =>For Example 1:- If a Member named "S" who Deposited via Payza and doesn't make more deposit in future, then S is allowed to withdraw via Perfect Money or Payeer or Neteller or Skrill or by all 4 Payment Processors(means can change payment processors anytime and unlimited times to withdraw) for the lifetime. =>For Example 2:- If a Member named "S" who Deposited via Payza and in future "S" Deposited Total $1000 or more via Perfect Money and Total $999 or less via Payeer or Neteller or Skrill, then S is allowed to withdraw Total $999 or less via Payeer or Neteller or Skrill and unlimited amount via Perfect Money for the lifetime. =>For Example 3:- If a Member named "S" who Deposited via Payza and in future "S" Deposited Total $1000 or more via Payeer and Total $999 or less via Perfect Money or Neteller or Skrill, then S is allowed to withdraw Total $999 or less via Perfect Money or Neteller or Skrill and unlimited amount via Payeer for the lifetime. =>For Example 4:- If a Member named "S" who Deposited via Payza and in future "S" Deposited Total $1000 or more via Neteller and Total $999 or less via Payeer or Perfect Money or Skrill, then S is allowed to withdraw Total $999 or less via Payeer or Perfect Money or Skrill and unlimited amount via Neteller for the lifetime. =>For Example 5:- If a Member named "S" who Deposited via Payza and in future "S" Deposited Total $1000 or more via Skrill and Total $999 or less via Perfect Money or Neteller or Payeer, then S is allowed to withdraw Total $999 or less via Perfect Money or Neteller or Payeer and unlimited amount via Skrill for the lifetime. =>For Example 6:- If a Member named "S" who Deposited via Payza and in future "S" Deposited Total $1000 via Perfect Money, Total $1000 via Payeer, Total $1000 via Neteller & Total $1000 via Skrill, then S can withdraw unlimited amount via Perfect Money or Payeer or Neteller or Skrill or by all 4 Payment Processors(means can change payment processors anytime and unlimited times to withdraw) for the lifetime. Please read and Understand this post carefully and Still you have doubt then please ask in replies to this Forum Post. Now we can use payment processors Neteller and skrill. We are able to set such limits according to Memberships only. So, that's why we changed Minimum Withdraw Limit of Standard or WaterDrop Membership from $2 to $5 and other Memberships already having it at $5. In future, we are planning to add SolitTrustPay also.